Photo Caption: Dayna Hall, Senior Art Director for digital advertising company Undertone’s PIXL Studios, addresses Berkeley College graphic design students during a career-focused speaker series arranged by the Berkeley College School of Professional Studies on June 12, 2017. 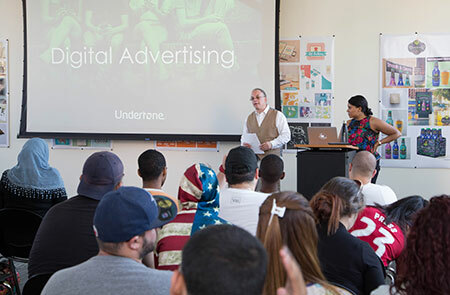 Held in The Gallery at Berkeley College in Woodland Park, NJ, the series provides students opportunities to hear from and speak with successful practitioners in the graphic design field. Ms. Hall is an award-winning creative professional whose work involves traditional, digital and social campaigns. She has worked on more than 150 brands, including Starbucks, Coca-Cola, Under Armor, L’Oreal and Novartis. Pictured above, Carlos Cruz, Chair, Graphic Design, Berkeley College School of Professional Studies (left), introduces Ms. Hall (right) to students in attendance. Click here to watch Ms. Hall’s presentation in its entirety.